In the period November 20-23, 2018 a delegation consisted of NDC Skopje representatives, teachers and school principals from Nansen model schools participated on a study visit to Belfast, Northern Ireland. The delegation was welcomed by NICIE staff and attended a presentation organized by Ms. Paula Mcllwaine that presented the history and development of integrated education in Northern Ireland. During the visit, the delegation visited Forge Integrated Primary School where they were welcomed by the school principal, Mr. Neville Watson and the school staff. The group also visited Millennium Integrated Primary School where the school principal Mr. Barry Corrigan hosted a presentation and a tour of the school facilities. The teachers and school principals from the Nansen model schools had an excellent opportunity to get closely acquainted with the work of the integrated schools in Northern Ireland and the efforts that were made to advance the work of the schools throughout the years. 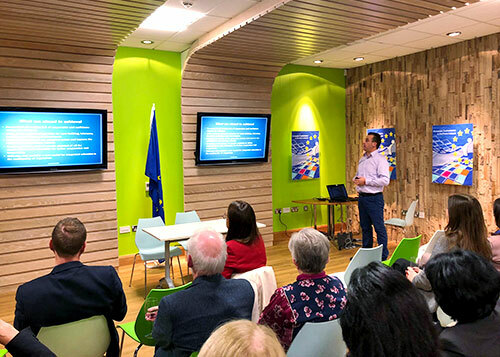 As part of the visit to Belfast, NDC Skopje Executive Director, Mr. Sasho Stojkovski held a presentation at the European Commission Office in Belfast about the history and development of the Nansen model for intercultural education and its impact on the overall education system in Macedonia. The presentation was attended by representatives of the education department, NICIE staff, Integrated Education Fund and teachers. The delegation led by NDC Skopje was delighted to attend the celebration event “The Big Small Stories” as well as the promotion of the book “There Were No Desks” organized by the Northern Ireland Council for Integrated Education and hosted by NICIE CEO Roisin Marshall at Lagan College. NDC Skopje wholeheartedly thanks NICIE staff as well as all friends and supporters from Northern Ireland for the continuous support over the years in the joint efforts to improve education by promoting interculturalism, integration and inclusion.